I am Diane Brown (dbro), an artist and illustrator living in Texas. I enjoy all phases of the creative process. Enjoy and comment! The first banner. Hung for the first Sunday in Advent. 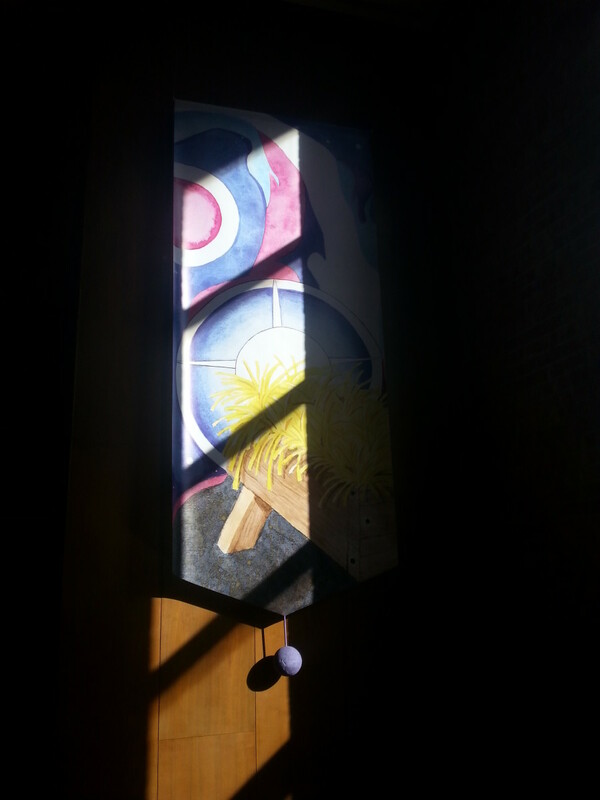 Our church has a liturgical arts group whose mission is to decorate our church for the holidays. I have written articles before about our projects and processes (see "Decorating the Altar for Advent and Christmas - A New Approach" and "Decorating the Altar and Sanctuary for Lent and Easter"). 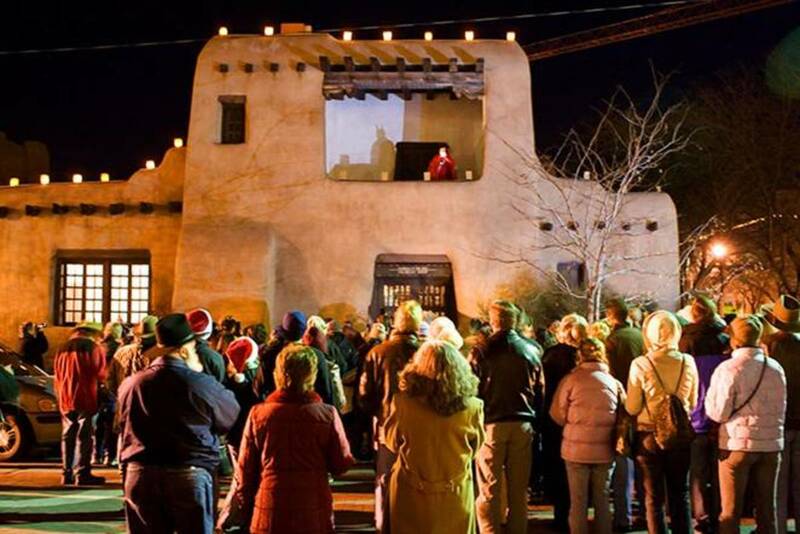 This article will explain our approach and techniques for an unusual and beautiful display for the season of Advent and Christmas. How does your church decorate for the holidays? New decorations are displayed every season. Our church has the same decorations year after year. Each year around July or August our group confers and decides on a theme/imagery for the coming winter holiday. 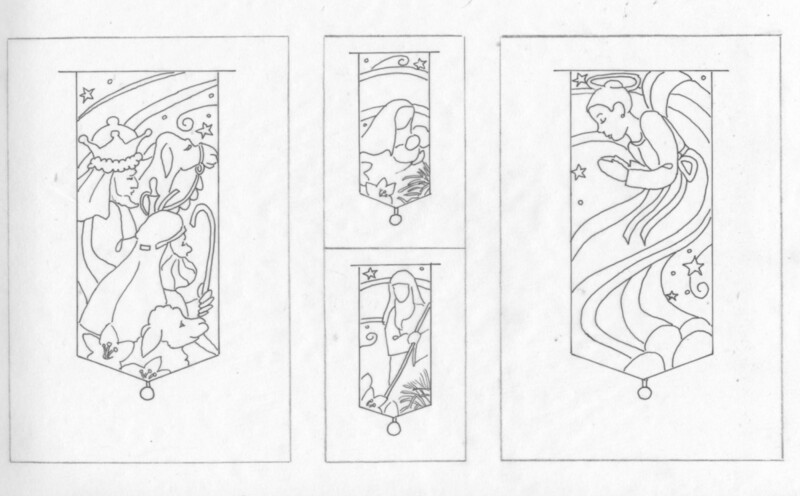 This year I had devised an idea using traditional Christmas images in the form of banners to hang around the altar. I sent this drawing to my fellow members of the group. 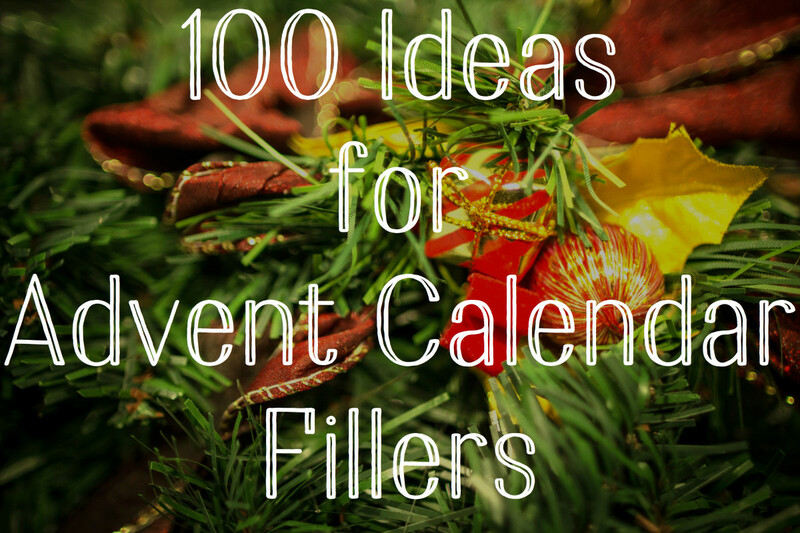 One of our members encouraged me to think about Christ’s advent in a different way. 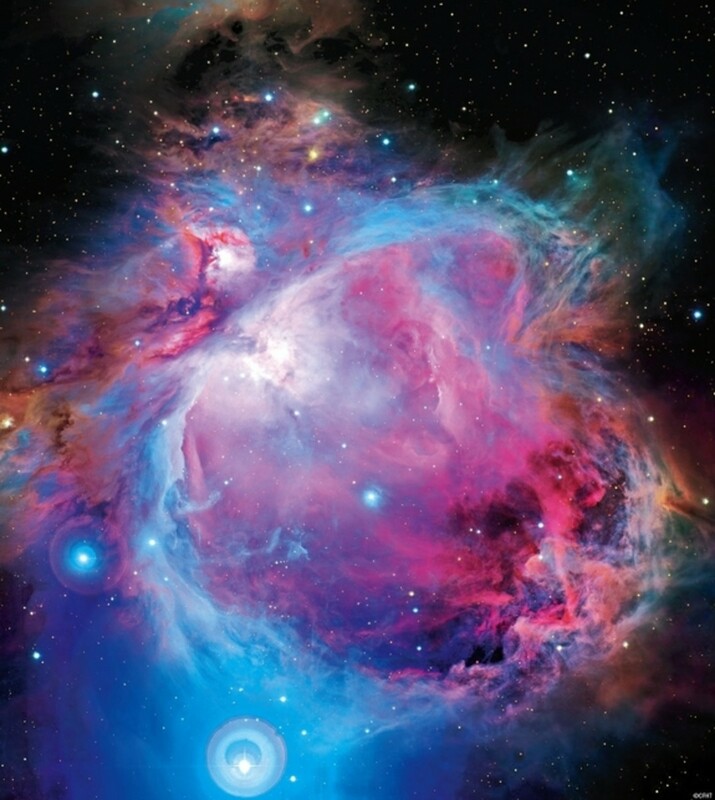 Along with text about the “Word Incarnate,” he included a picture of a nebula. The image and the text caused me to think about the limitlessness of God’s power, the vast beauty of His creation, and His abundant, transcendent love. I used the basic structure of the banners as I had designed them, but I totally changed the content on them. I used the image and colors in the picture of the nebula and created a flowing adaptation of this image to “travel” across the front of the church. 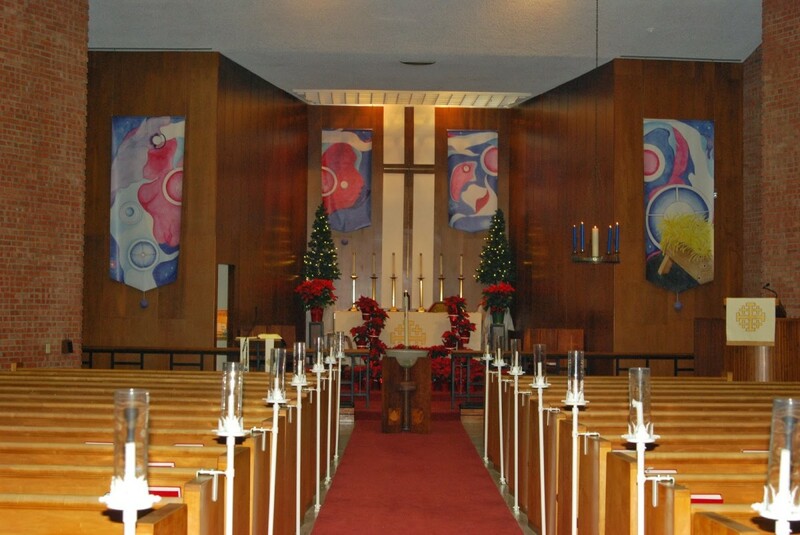 These four banners were displayed in serial fashion, one banner added every Sunday in Advent, culminating with the appearance of the fourth banner on Christmas Eve. 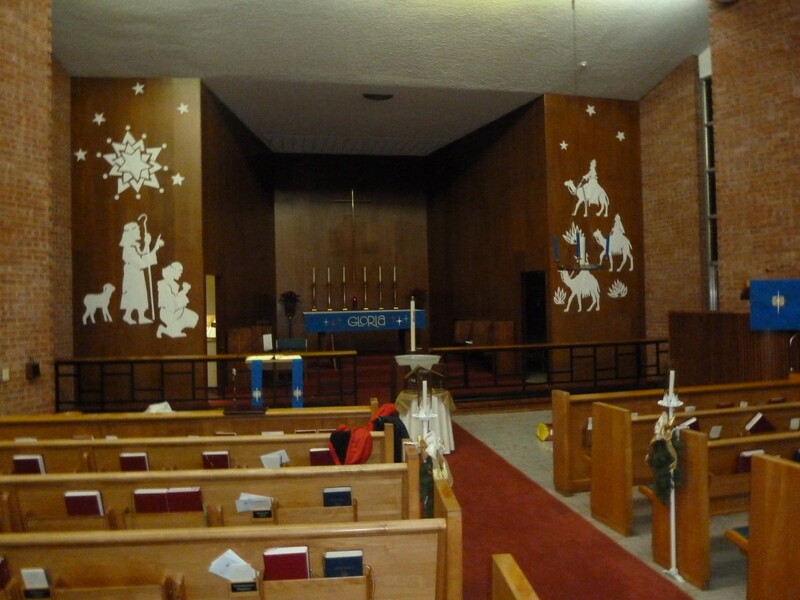 The banners are designed to appear to flow across the altar, from left to right, with the "center of interest" being the appearance of the manger. This is a color study for the banners done prior to the final version. John 1:14 - "And the Word became flesh, and dwelt among us, and we saw His glory, glory as of the only begotten from the Father, full of grace and truth." 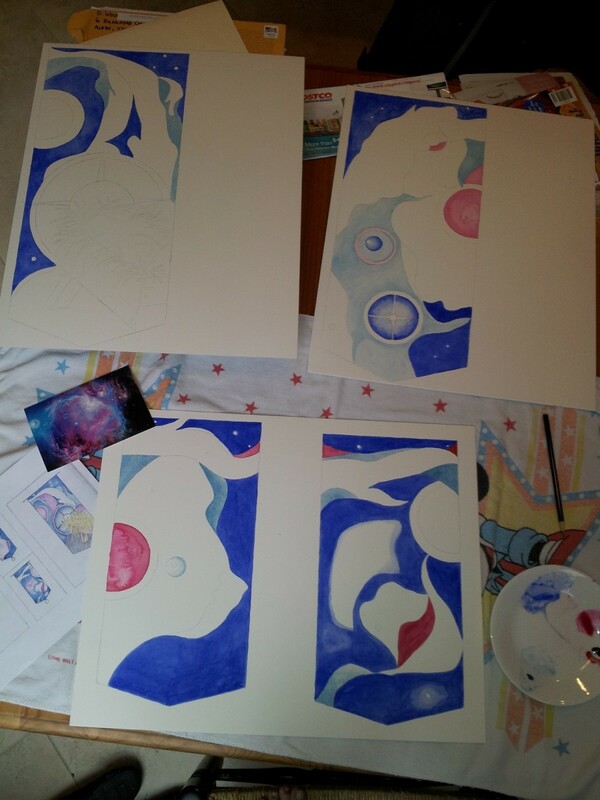 I used watercolor and watercolor board to create the images for the banners. The scale of the walls at the altar of our church is quite large – I would have to create the paintings at a size that was comfortable for me to work at and then have the paintings scanned digitally at a very high resolution to allow for the images to be enlarged to the size needed for our display. The paintings themselves took several weeks to complete. 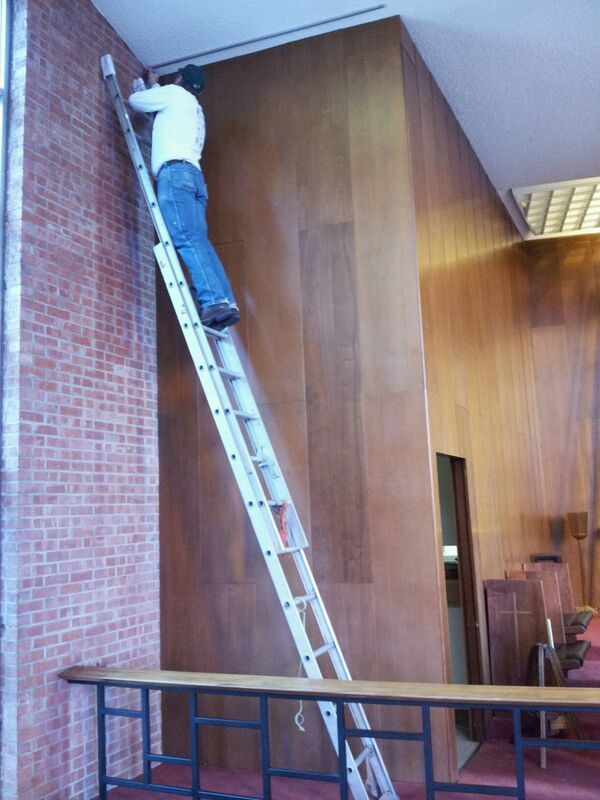 This is why I encourage anyone interested in taking on the task of decorating their church space for the holidays to get what seems like a very long head start. In our case, not only did we need time to create the paintings, we also needed enough time to allow the paintings to be scanned and printed in a much larger size. Another member of our group is experienced in the scanning and printing process, so she had the responsibility of getting bids and samples for us to compare. A note here about the cost of this process. It isn’t cheap! Make sure you establish a budget for your project and do your best to work within it. Not only did our church invest the dollars to have the work scanned and printed, they also paid to have a set of hangers installed that is inconspicuous, but sturdy to hang banners or displays of any kind going into the future. We could have made our display without these hangers, but having them made the process much easier. Plus we have the hangers in place for all our future decorations. 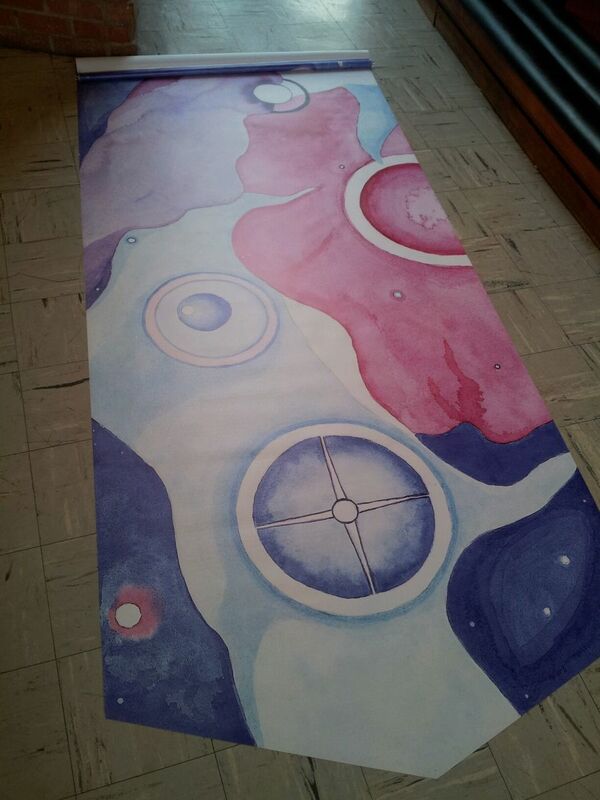 One of the completed banners. After seeing the samples, we decided to have the images printed on heavy vinyl. The printed images had some loss of vibrancy, which was troubling, but when hung on their own without comparison to the paintings they were quite attractive. The ceilings in our church are quite high, over 20 feet tall, so the banners had to be quite large to make the impact we were hoping for. To this end, the banners were printed on the vinyl measuring approximately 8 feet long by 3 feet wide for the outer banners and 6 feet long by 2 feet wide for the ones closest to the cross. 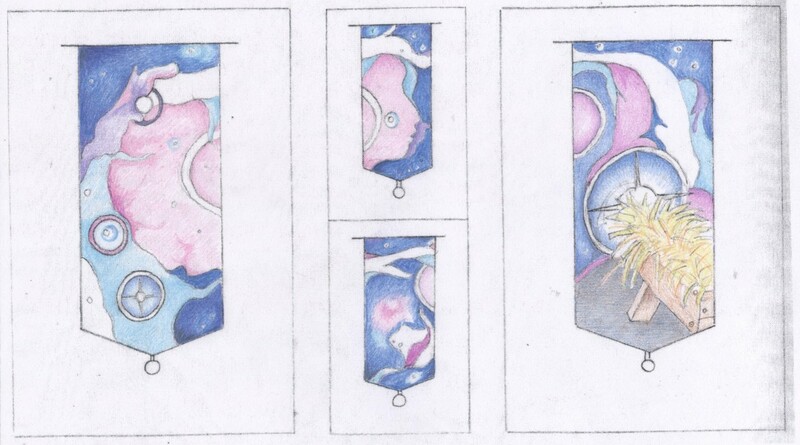 As a way to finish the banners, a hanging ball, or "fob" was designed to be attached to the bottom point of each banner. 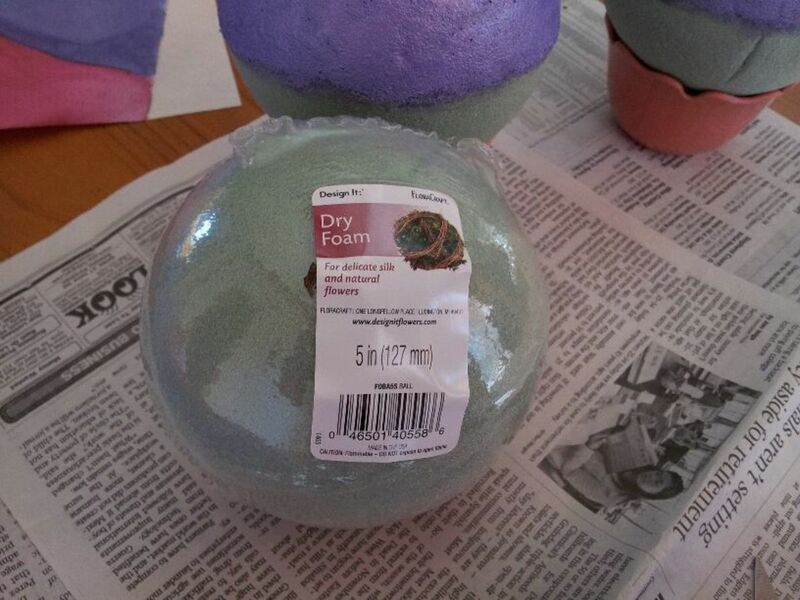 These were made from florists foam in the form of a ball (typically used as a form for topiary) and a dowel. 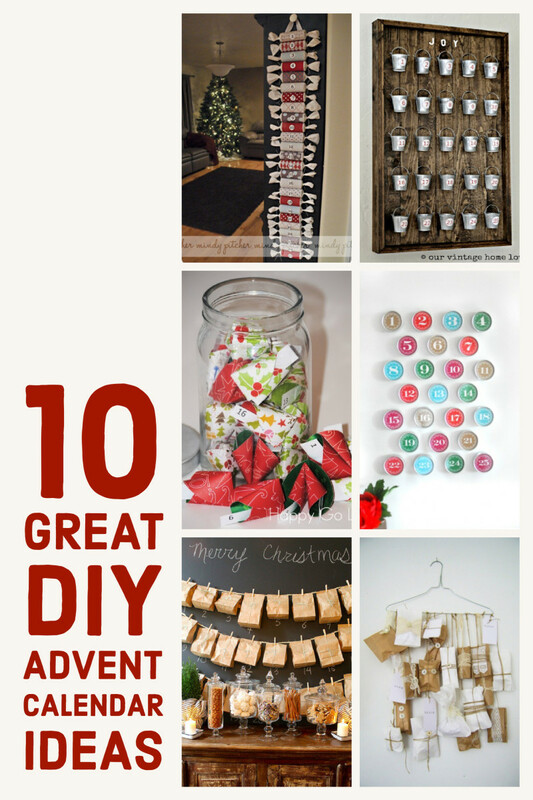 These items are available from most any craft or general merchandise store. These were then painted, glued together and attached to the back of the banners at the point. The Saturday before the first Sunday in Advent the first banner was installed. Previous to this job, the hangers were put in place in the ceiling of the church parallel to, and almost flush with the walls. Two of these hangers were installed in each position to allow for overlapping displays in the future. 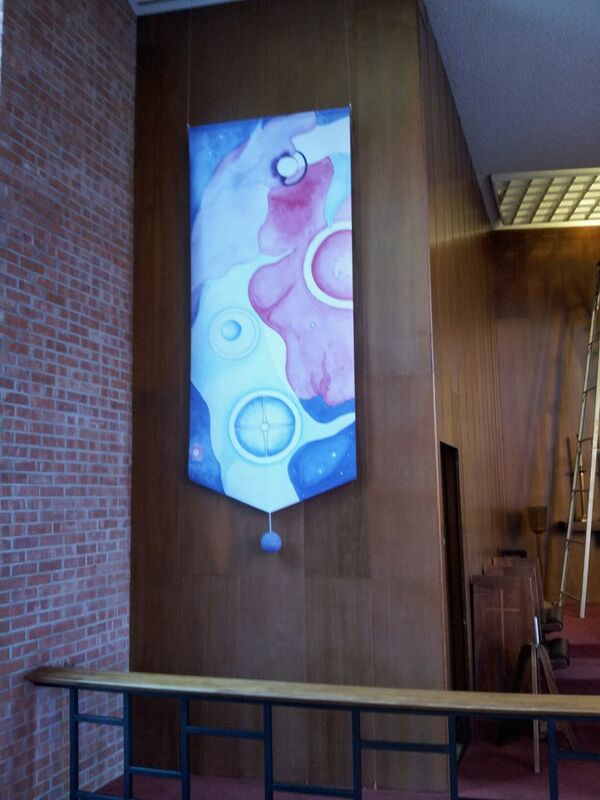 Each Saturday in Advent the next banner was installed until all four banners were in place. 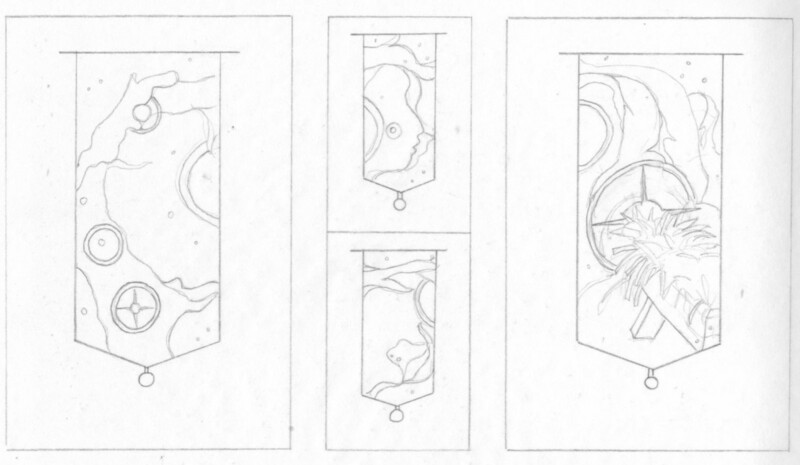 The banners have a celestial feel, since they were patterned after the nebula photo referenced above. 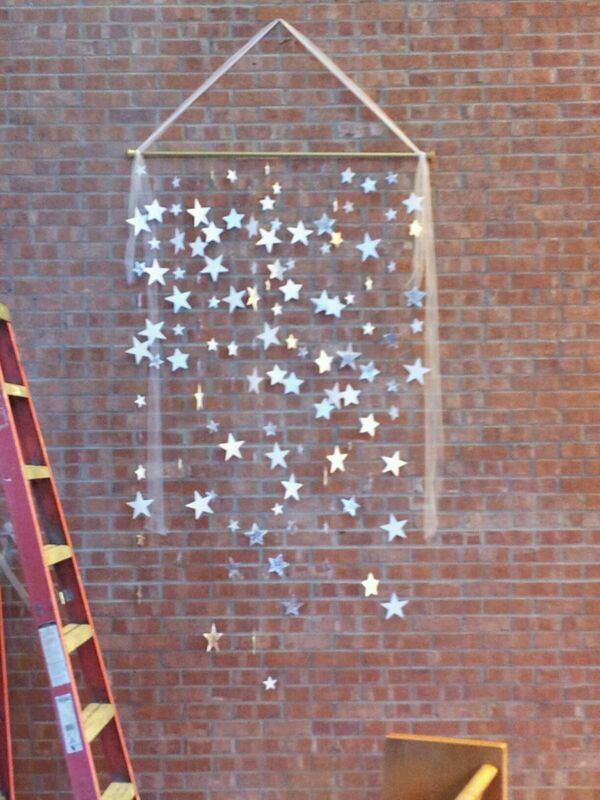 To continue this theme out into the rest of the sanctuary, one of our members devised a star mobile to hang on the walls of the church. We enlisted the help of our Sunday school children in creating these mobiles. It is one of our goals to engage our younger members in the projects we undertake and this, I think, helps our children to feel more a part of our church community. This project was lots of fun to create and was met with a very warm response from our congregation. In spite of the fact we decided on imagery not typically envisioned when thinking about Advent and Christmas, I believe we were successful in providing decorations that in some small way portrayed the majesty and overwhelming mercy and love of our God. Creating a display of this size and magnitude requires the time, talent, and dedication of many gifted individuals. When these individuals have a devotion to their tasks and they respect each team member, undertaking a task of this sort is incredibly rewarding. I would encourage you to form a group to devise the decor for your church's holiday seasons. Hi, Sharon! Thanks for your comment. The stars were made of card stock, if I remember correctly, and yes they were sprinkled with glitter. They were hung from the dowel with fishing line to help them look like they were floating. The stars were not adhered to the wall. I hope this helps. Let me know if I can answer any other questions you may have. I love this idea of the stars - are they against the wall or is there some space between the stars and wall? Was itt plain paper that you used or card stock with glitter? Thanks, hoping to start soon for Christmas. Hi, Nicole! Thanks for your inquiry. As I remember, it was just a case of taping the fishing line to the stars with transparent (Scotch) tape. It was very easy to do, though the fishing line is somewhat tedious to deal with. I hope this helps. I'd love to see your display when it's done. Maybe you could shoot me a photo! Hi! 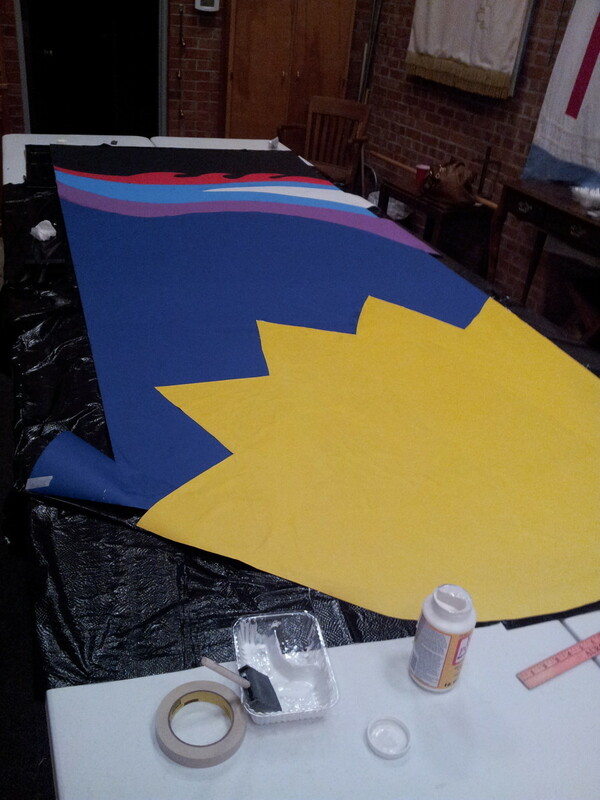 My liturgical arts committee absolutely loves the star banner. 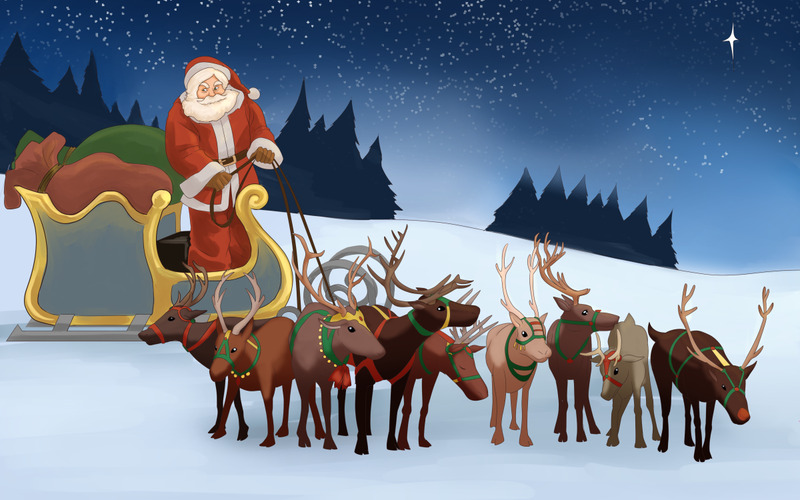 We are currently planning Advent decorations and would like to make this banner. Are the stars hung from fishing line? If so, how did you connect the stars to the finishing line. I will look forward too seeing what you do. I'm sure it's going to be beautiful! Thank you for your response. I don't have your artistic talent or budget but I can recreate the star mobile. I will send you a picture of our display when we get it finished. Thank you, Jen! I'm glad you liked our display. You know, our Sunday school kids made the stars from a pattern one of our team members found on the internet. The stars were then covered in glitter (of course!) and hung from fishing line from the dowel. It was a time-consuming process, but I think the outcome was well worth it. How did you make the stars? I love everything you did.